November's update brings you something very special indeed. It is very unusual to find a product from the Buchschmid and Gretaux Wood Inlay Company which is still in its original box. But, for our November update, not only do we have one B & G picture still in its original box, we actually have two! How's that for something incredible? So, read on and enjoy! Our November update brings you something very unusual, as you can see the two Buchschmid and Gretaux wood inlay pictures on display here are still in their original boxes! Now, how many Buchschmid and Gretaux pictures will you find these days which are accompanied by (let alone 'still in'!) 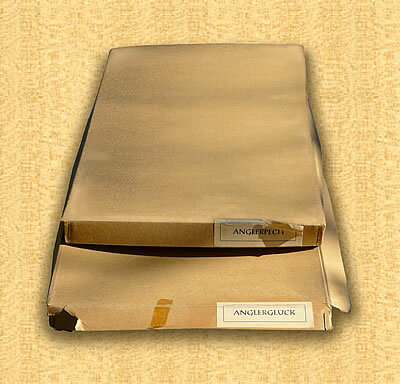 their original boxes? Not many, if not any at all, we would estimate. 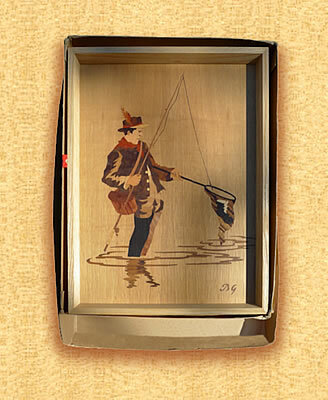 These two Buchschmid and Gretaux 'Fisherman pictures' owned by Don Traughber were actually purchased by Don in 1963 while he was in Bamberg, Germany. Don tells us the two pictures are in brand new condition and have never been placed on display. Keeping them in their boxes has certainly paid dividends with these two pictures. The veneers still look as fresh as they would have done when the pictures were made. The bleaching effect of sunlight has been prevented and has enabled the delicate coloring of the flesh colored veneers to remain intact. 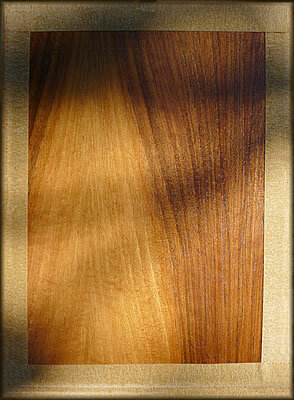 The varnish likewise shows no signs of cracking or splitting as far as we can tell. The boxes have prevented the problems of temperature change, humidity variations, and sunlight with it's consequent bleaching effect from taking place. These, plus general wear and tear from years of display have all been halted from taking their toll on these pictures. Given the drying effect of central heating caused by its reduced humidity levels, most Buchschmid and Gretaux wood inlay pieces do tend to succumb to the unfortunate problem of the varnish cracking. 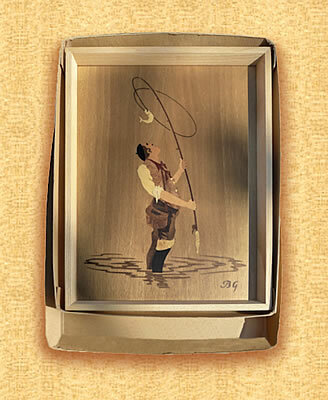 This is usually caused by varying expansion and contraction qualities of the veneers, baseboard and glues used in the production of these wood inlay (marquetry) pieces. The expansion and contraction rates of each species of veneer will be slightly different to each other, likewise the expansion and contraction of the glues and baseboard will also vary accordingly. And then, take into account the expansion and contraction rate of the varnish itself, and you can see the reason why all these variable tensions can cause a conflict which results in something 'giving way' - which nearly always turns out to be the varnish cracking! If the cracks become too big, this can sometimes loosen sections of veneer and pieces can literally 'fall off'! To prevent this happening, keep a small container of water in the room with your picture. This will provide a small level of moisture in the air and prevent the drying out. DON'T apply water directly to the picture as this would cause more problems than it solves! Click the above button to return to page 43 of "Can You Help"